Hey dolls! 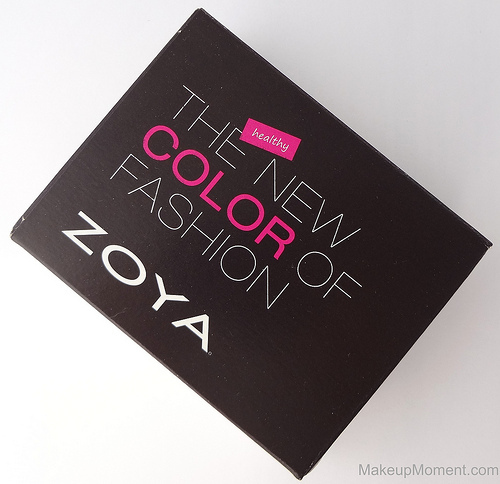 I hope you are all enjoying your day :) Last week, Zoya was giving away a limited number of Pinterest trios that contained three mini nail colors, from Zoya's Beach & Surf Summer 2012 collections. The trio was absolutely free to request. All that had to be paid was the shipping and handling. Well, I just received my Zoya pinterest trio in the mail a few days ago, and I couldn't have been anymore excited. It is no secret that I am a Zoya fan-I have raved about their polishes numerous times on here, and I am very happy that I added these three fun, summer-inspired shades to my collection. Myrta: Orange/coral with fine, gold and silver shimmers. This is such an interesting color. I don't have anything like it in my collection. Very hot shade for summertime! I envision this one complimenting a tan, beautifully. Application went smooth with Myrta. I got even, opaque coverage, with two coats. Kimber: Magenta with fine, golden shimmers. I really like how the pink is combined with the pop of gold. Makes the shade extra special. Those who adore pink polish colors, will love this one. Can't wait to sport Kimber as a pedi color. This one was the sheerest of the bunch. Even after two coats, there was still some visible nail line preset. I definitely recommend a third or fourth coat, for total opaqueness. Zuza: Turquoise with fine, silver shimmers. Can I just say how stunning this shade is? I can't stop staring at my nails! So beautiful and perfect for when I want to add a colorful pop on my nails. Zuza did not disappoint when it came to application. I got smooth, even, and opaque coverage, with just two coats. Drying time of these was super fast, and I just loved how they all dried to a beautiful smooth, shiny metallic, foiled finish. Although I haven't tested these specific shades for wear time, I typically get anywhere between 3-5 days wear, before I start to see any chipping and tip wear. Not bad, at all. Before I forget to mention, Zoya nail polishes are vegan friendly and are free of Toluene, Camphor, DBP, and Formaldehyde. Love that! Did any of you receive the Zoya Pinterest Trio? What do you all think of the nail colors? Disclaimer: I am not affiliated with any of the companies mentioned above. Zoya was giving away mini nail polish trios for free, and I paid the shipping and handling charges with my own personal funds. Zuza is absolutely beautiful! What a shade! I love these too! Zuza is my favorite, I also love how it is almost a one coater!